A one-of-a-kind business location that combines convenience and community with unmatched views of the San Francisco Bay. 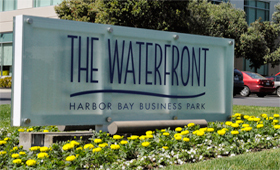 The Waterfront at Harbor Bay is a 390,000 square foot Class “A” office park comprised of five office buildings and one light assembly and distribution building on 26 acres within the Harbor Bay Business Park, built between 1996 and 2000. Situated on the eastern side of the San Francisco Bay, the 325-acre master planned Harbor Bay Business Park is home to more than 100 companies engaged in areas such as technology research, development, support, software and hardware, professional sports, business services, engineering, telecommunications and biotechnology. The Business Park also includes several hotels, restaurants and private schools. Located three minutes from the Oakland International Airport and on the San Francisco Bay, this state of the art campus offers its tenants the highest quality office space in Alameda with views of San Francisco and the Bay and access to miles of waterfront trails. © 2017 Jones Lang LaSalle. All Rights Reserved.